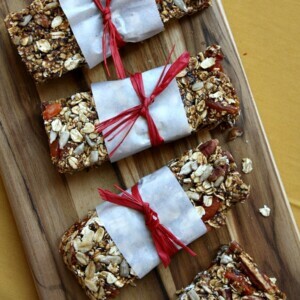 These Homemade Granola Bars are chewy and full of nuts and fruit. Preheat the oven to 325 degrees F. Line an 8x8-inch or 9x9-inch baking dish with parchment paper, leaving a 2-inch overhang on 2 sides. Spray with nonstick spray. In a heat-safe bowl, cover the prunes with hot water. Soak for 10 minutes. Drain and place in the bowl of a food processor fitted with the steel blade. Add the syrup, molasses, cinnamon, vanilla and salt. Process to form a thick paste, about 20 seconds (stopping to scrape down the sides of the bowl once or twice with a rubber spatula). Add 2 cups of the oats and pulse 8 to 10 times, until the oats are coarsely chopped. Transfer the mixture to a large mixing bowl. Stir in the remaining 1/2 cup oats, apricots, nuts and sunflower seeds. Using slightly dampened hands, press the mixture firmly and evenly into the prepared pan. Bake for 25 to 30 minutes. Cool the dish for 15 minutes at room temperature, then transfer to the freezer and chill until completely cooled (about 30 minutes). Cut into 10 or 12 bars. Store in an airtight container at room temperature. *If you are preparing this recipe as gluten-free, just be sure to use brands of syrup, molasses, vanilla and oats that are known to be GF.